The TEDS standard for all course papers, capstones, master's theses, doctoral projects and dissertations is the TIU Style and Format Guide on myTIU. 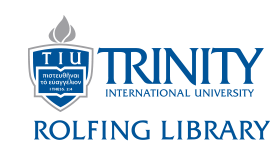 The Guide provides writers specific details relative to writing a document acceptable to Trinity. Writers are advised to examine their style and formatting early in their writing process in order to avoid delays in their graduation. For style questions not covered by the TIU Style and Format Guide, consult the Turabian Quick Guide or the Chicago Manual of Style Online. Zotero is a free bibliographic management program that one can use with any of these three browsers: Firefox, Chrome, or Safari. It allows one to download references from TrinCat, WorldCat, and most of our databases, including ATLA, Academic Search Premier, and PsycIFO. After downloading references, Zotero can be used with its corresponding Microsoft Word (or Open Office counterpart) plugin to create parenthetical references/footnotes and bibliographies in many different citation styles. See our guide here for help with Zotero or click on the tab for Zotero above. See our helpful guide for tips on researching and writing an academic paper at TEDS. The Center for Theological Writing of the Thrive Center (formerly the USSC) helps TEDS/TGS students with their academic and theological writing needs. You will need to schedule an appointment with a tutor. You can call the Thrive Center at (847) 317-8193 or email them at thrive@tiu.edu. *Note: Word 2010 is installed on the computers in the Carl Henry lab in the library. Add and format page numbers. Add different page numbers or number formats to different sections. The Microsoft Word help page.